Once you start exercising you’ll realize both how much better you feel and how any issues those round you already have. That was certainly my experience as I raved about my new routine; only to find my dad was struggling with exercise thanks to his knees.It got me thinking about ways to make it easier for him. That’s what made me think about the best exercise bike for arthritic knees. If this is an issue that you’re facing; then remember you’re not alone. There are approximately 54 million adults with arthritis and that’s only those diagnosed by a doctor. With a little help from my dad I was able to test a wide variety of exercise bikes. To be honest I wasn’t surprised when the Schwinn 270 made its way into the top 3. But, a surprise finalist and ultimate winner was the Sole Fitness R92. Put simply I was impressed by its value and the way the ergonomic design has really helped my dad to improve his fitness; without aggravating his arthritic knees. Who knows he may even need a good wetsuit next! The Exerpeutic 400XL folding recumbent exercise bike wins third place on account of its budget price and the fact that it is foldable; allowing you to accommodate it even if you have very limited space. This is a more basic model but still effective without straining your knees. Sole Fitness produces an array of fitness equipment. They are a relatively young company but are considered one of the fastest growing fitness brands in the world. The sole Fitness R92 is a stylish looking recumbent style exercise bike which seeks to provide maximum comfort; helping to ensure you can work out for longer even with aching joints. 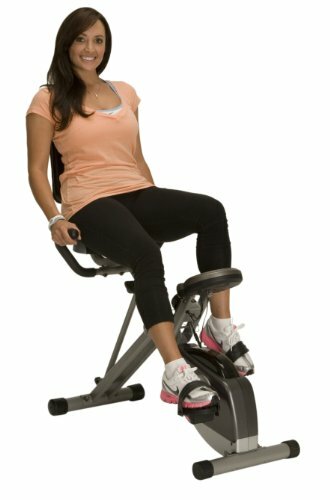 This and its step through style make it the best exercise bike for arthritic knees. There is no doubt that this is a well put together machine. It is made with heavy steel tubing and coated with aluminum. In effect you’re going to struggle to destroy this exercise bike. Of course this quality does come with a price; the Sole Fitness R92weighs 152 pounds but it can accommodate weights up to 300 pounds. The quality and durability of the best exercise bike for arthritic knees is backed up by a lifetime warranty on the frame, 5 years on all electronics and parts and a 2 year labor warranty. It should be noted this is not transferable. Alongside the weight of the bike you’ll discover there is a 26 pound flywheel. This ensures the R92 won’t move across the floor when you’re exercising while giving you a really smooth ride. Unsurprisingly this bike has an array of features that help it to win the title of the best exercise bike for arthritic knees. There are 10 programs; 2 are heart training, 2 are custom and the other 6 more standard style program options. These are complemented with a 9 inch blue backlit screen. The seat can be adjusted into any one of 12 different positions. But perhaps the best feature is the 2° inward slant of the pedals. This is specifically designed to reduce pressure on your knees and feet. You can also try out any of the 20 different resistance levels; all electronically controlled and changeable at the touch of a button. In addition to the seat being adjustable you’ll be pleased to note there is a fan built in to help you stay cool as you workout; plus a water bottle holder to keep you hydrated. Alongside the comfort of the seat you’ll find a heart rate monitor built into the handlebar grips and it also has the capability of interacting with a chest strap to track your heart rate. The chest strap is included. You can even enjoy your favorite workout tracks thanks to the built in speakers and connector for an iPod or MP3 player. Of course you’ll be able to check the usual data from the comfort of your seat; time, speed, distance, calories burned, etc. In common with most exercise equipment it will arrive at your door in a nice box and in need of some assembly. Fortunately there are good instructions and the entire process should take you no more than an hour. 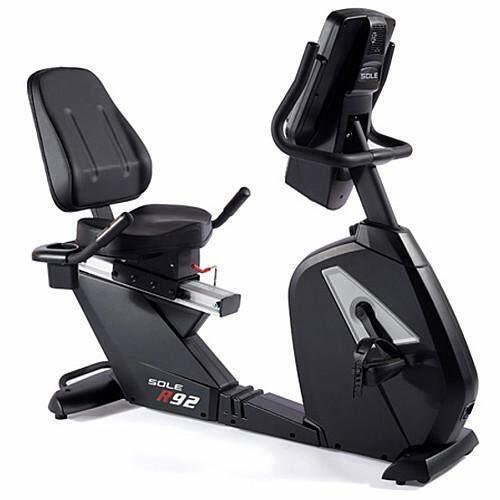 The R92 is the best exercise bike for arthritic knees and a top end product. This makes it a little surprising that they only added 10 exercise programs. While this is sufficient for the novice and intermediate people you may find it slightly lacking when you reach peak fitness levels. It would really help if the R92 was connected to apps that would allow you to mix up the programs more; without this it is possible to stagnate as you continue to do the same routine. The R92 weighs 152 pounds. While it does have two wheels on one end this is still a significant weight o move round your room or house. Once you’ve positioned this exercise bike it’s likely to stay put; you need to consider this! The Schwinn 270 is one of the best exercise bikes in the world. It is considered the best recumbent bike produced by Schwinn and it shows in the quality of the product and the warranty. It does have more program options and features than the R92 but it loses points for the low weight flywheel. That’s why it’s second on the list of the best exercise bike for arthritic knees. The Schwinn 270 has a step through design; this means you’re not straining your arthritic knees or hips before you even start riding. Alongside this you’ll discover the seat has an excellent range of movement; allowing you to get it in just the right position for your exercise routine. The back of the seat is vented to help you stay cool while riding. The 25 levels of resistance are adjustable as you ride and give a great feeling of riding up hill. You’ll also appreciate the 29 exercise programs. 9 of these are heart rate programs, 12 are profile workouts and there are custom options as well as fitness tests. Your data is displayed on two LCD screens allowing you to see everything you need to know at a glance. As an extra you’ll get a water bottle holder and a 3 speed fan; next to the media shelf. Working out has never been so pleasurable. This exercise bike is built to last. Although it weighs just 88 pounds it is capable of handling up to 300 pounds in weight. The addition of the center support helps to make this possible and keeps the bike running smoothly as you exercise. 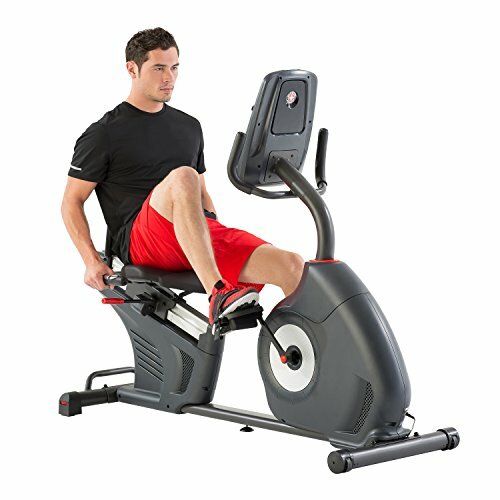 The Schwinn 270 outdoes the R92 in terms of connectivity although this is not enough to steal the crown of the best exercise bike for arthritic knees. You can track your fitness progress on the screens or you can download the data via a USB and then add it to your Schwinn Connect account. This can also link with other exercises you do to really monitor your progress and help you to improve. Of course no machine is perfect and the Schwinn 270 is not an exception. The flywheel weighs just 17 pounds. This means you might not get the resistance you want. A heavier flywheel will also help the bike to feel more stable. It should be noted that anyone over 6 foot will probably struggle to extend their legs properly on this recumbent. This is likely to make your arthritic knees worse; but only if you’re a taller rider. There have been a number of complaints from customers regarding the poor quality of the packing materials leading to a damaged exercise bike being delivered. In addition some customers have received defective goods. It is worth noting that the Schwinn customer service team is very good at resolving these issues. Exerpeutic exercise equipment is supplied by Paradigm Health & Wellness who specialize in all types of exercise equipment. They have been trading since 2007 and are dedicated to supplying you with the best products at the right price. 33 inches long, 19 inches wide and 49 inches high. The Exerpeutic 400XL is just 39 pounds and only 19 inches wide. That sounds like a recipe for a bike that will wobbly a lot. But, surprisingly it isn’t. This recumbent utilizes a steel tubular frame which helps to make it feel sturdy and remain in position; it won’t move regardless of what floor type you have! It is worth noting that this is only if you have a level floor. If your floor is uneven there are no levelers to help you. Paradigm state that the Exerpeutic 400XL can be used by anyone between the height of 5ft 2” and 6ft 2”. Of course this will depend on how long your legs are in relation to the rest of your body. You can easily adjust the position of the seat by turning the adjustment knob underneath it and sliding the seat into the correct position. You can even move the seat up and down! The 8 resistance levels are set via a knob. This can be done while you’re exercising but it’s not as easy as an electronic option; you’ll probably need to slow your pedaling to adjust it smoothly. Of course if you have arthritic knees you’ll want the resistance set low to avoid putting unnecessary pressure on your knees. The V belt drive does help the ride to be incredibly smooth and quiet; this will be beneficial if you like to work out in front of the television or when the rest of your family are in bed. You’ll also benefit from a variety of information displayed in front of you; such as distance, speed, time, calories burned and heart rate. What makes this so good for anyone with limited space is that the Exerpeutic 400XL can be folded; reducing its size in half. This make sit great for small houses or even in your office at work. All you have to do is remove two pins. The legs push together and the screen post goes down before you reinsert the posts. You can then lift the front end to utilize the rollers on the back and slide it into its home position. It is important to be aware that this is not a full recumbent or an upright. It is half way between the two. This means you’ll not going to get the maximum level of workout or relieve the pressure quite as much as you would like on your knees. This doesn’t mean it’s not a good machine though! It is disappointing to note there are no pre-set workout options. You can’t just push a button and go; you’ll need to decide how long you want to exercise at which resistance levels and track it yourself to change it. This shouldn’t stop you buying the Exerpeutic 400XL but it is disappointing that no programs are included. The bike needs to be put together when you receive it. Sadly the instruction manual is not as good as it could be. You’re likely to take much longer than you expect to get it all ready; then you’ll have to work out a program before you can get started. All 3 of these exercise bikes have their place. If you’re new to exercise then the Exerpeutic 400XL is a great starting point. But, despite the features list on the Schwinn 270 there is no beating the R92; it offers excellent value for money and a routine that will suit nearly any athlete or newbie. That’s why I got the Sole Fitness R92 for my dad and why he’s happier than he’s been in a long time; his improved fitness is just a bonus!